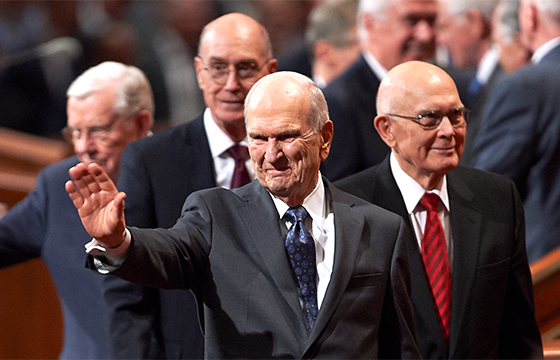 The first people were baptized members of The Church of Jesus Christ of Latter-day Saints in 1978. In the 1950s the Book of Mormon: Another Testament of Jesus Christ, a companion scripture to the Bible, along with various pamphlets about the Church found their way to Ghana. These were read by many Ghanaians who were converted to the gospel and used them as a basis to start their own Church of Jesus Christ of Latter-day Saints congregations. In 1964 Joseph W. B. Johnson gained a testimony of the Book of Mormon and provided leadership in organizing and directing congregations consisting of hundreds of followers. In 1978 two missionary couples entered Ghana from Nigeria and baptized many of Johnson's congregations. A building program began in 1979. Within a year more than 400 people had been baptized and branches (small congregations) were organized. By 1981 seven branches were functioning in Ghana. All converts were taught the gospel in their own language and trained in leadership skills. On June 14, 1989, Ghana's government expelled the missionaries and banned the Church. Members were permitted to hold services in the privacy of their homes, however. Eighteen months later the government expressed satisfaction that the Church teaches members to be obedient to government laws and promotes racial harmony, and on December 1, 1990, Ghana permitted Church activities to resume. By the end of 1990, membership was more than 9,000. In 1998, Church President Gordon B. Hinckley met with Ghana's Head of State, Mr. Rawlings, who apologized for the action taken by the government in 1989. President Hinckley informed Mr. Rawlings that the Church would build its first temple in West Africa in the capital city of Accra. He also met with thousands of members in Accra and announced the plans to build the temple. In the 1990s humanitarian efforts have focused on member self-reliance. A number of projects were undertaken through local initiative by members in districts and stakes (dioceses). Some 90 percent of LDS Church buildings in Ghana include some form of gardening activity. The first missionary training center in Africa, located in Tema, Ghana, was dedicated on 17 May 2002. It has operated successfully for 15 years. The new Ghana Missionary Training Center, located in the Temple Complex, Accra, Ghana, opened in August 2017. It was dedicated in October, 2017 by Elder David A. Bednar, Quorum of the Twelve Apostles.